The ARPM (Advanced Risk and Portfolio Management) Lab is a constantly updated online platform for learning and teaching modern quantitative finance. The ARPM Lab spans the entire spectrum of Modern Quantitative Finance, across asset management, banking, and insurance, from the foundations to the most advanced developments. all the major asset classes: equities (public/private), fixed income, credit, currencies, alternatives, high-frequency, enterprise, etc. the most advanced techniques: data science and machine learning, factor modeling, portfolio construction, algorithmic trading, investment risk measurement, liquidity modeling, enterprise risk management, etc. While most materials on quantitative finance focus on asset pricing and risk neutral valuation (“Q”), the ARPM Lab focuses on the much broader applications to real world probability (“P”, learn more). The ARPM Lab is developed "bottom-up" to address the practitioners' needs, but is organized and presented "top-down" in a structured, academic manner, built around the sequential steps of the business process (see the figure): Valuation, ex-ante Risk/Portfolio Management (the "Checklist"), and ex-post Performance Analysis. 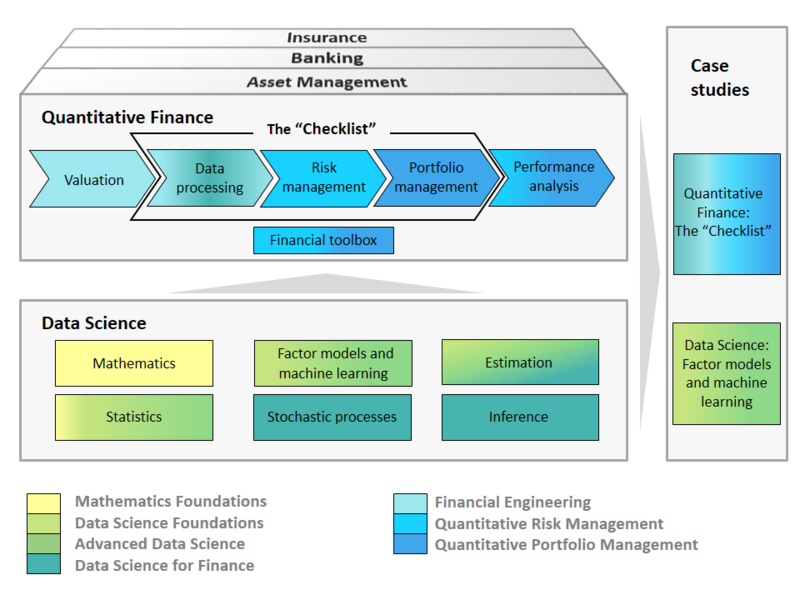 The quantitative business process is enabled by Factor Models and Learning and supported by a Quant Toolbox of techniques necessary to tackle these topics. This is what we do in the ARPM Bootcamp and in the ARPM Marathon. The same four modules are tested in the exams of the ARPM Certificate, which proves proficiency across all the parts of the ARPM Lab. The interconnections among the channels maximize the effectiveness of unstructured, “bottom-up” learning, which does not follow the recommended dependencies of the four Learning Modules. For instance, one may land on a piece of interactive code, and follow the code forward and backward across different topics; or switch to the theory on that topic to deepen understanding, or watch a video first, and then try an exercise.